It's easy to campaign to save endangered species like pandas and woolly spider monkeys because they're fluffy and cute. But what about venomous snakes? These are crucial predators in Brazil's Atlantic rainforest ecosystem, and a local doctor has made it his life's work to save one of the most dangerous. Carnival was in full swing in the small Brazilian coastal town of Itacare when a giant snake measuring 6m long slithered down the streets, sending hundreds of revellers screaming into roadside bars. Until recently the snake would have been killed. The police were standing by with shotguns. But instead the local doctor was summoned. Dr Rodrigo Souza moved to the north-eastern state of Bahia 12 years ago and developed a fascination with the rainforest and its wildlife. Now whenever a strange creature ventures into a built-up area, the doctor is called. He was even asked to rescue a group of confused penguins that had been swept up from the Falkland Islands by the mighty South Atlantic current. Souza identifies the carnival incident as a turning point in his battle to save endangered species in this dwindling patch of Atlantic rainforest in which he has made his home. When he first moved to Bahia it was common to see people illegally selling birds, snakes and monkeys at the side of the road. That rarely happens now. The authorities have clamped down and the local people have become more aware of the importance of saving their unique ecosystem. On the day I drove to visit him, someone stopped the traffic in the middle of the road to allow a snake to cross. 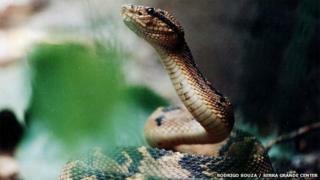 But Souza's real passion is the Atlantic bushmaster, one of the most poisonous snakes in the western hemisphere. Thick-bodied and up to 3m long, these majestic creatures have distinctive orange and black markings and heat-seeking sensors under the eyes that allow them to lock on to warm-blooded mammals. A human can die within an hour of being bitten unless they receive the right anti-venom injection. There are 35 bushmasters living in Souza's private snake sanctuary, which has a "No Entry" sign on the door bearing a large skull and crossbones. He's been compared by the Brazilian media to Grizzly Man, the American environmentalist who lived among the grizzly bears of Alaska until one of them killed him. Grizzly Man's life and death was the subject of a documentary by the German film-maker Werner Herzog. But Souza resents the comparisons: "I'm under no illusions about my snakes," he says. "They have no idea who I am and I know they would not hesitate to kill me." I admit to feeling absolutely terrified when he invites me into the sanctuary to watch him casually lifting up a 2m-long snake with an instrument resembling a giant metal tuning fork. Before handling them he zips into an insulated bodysuit that stops him from giving off too much heat. Meanwhile I'm standing a safe distance away - trembling with fear - in shorts and a T-shirt. The bushmaster has an almost mythological status amongst the indigenous people of the rainforest. Because of its attraction to heat they called it the "fire extinguisher" and have warned Souza never to sit near an open fire in bushmaster territory - because the snakes can leap a distance of several metres towards a heat source and at very high speed. He was once called to a road traffic accident where a bushmaster snake had attacked the headlamp of a passing motorbike. Rodrigo Souza is the first and probably only person ever to successfully breed the Atlantic bushmaster in captivity. He milks his snakes for venom which he then uses to make an antidote for snake-bite victims. The Bushmaster venom also contains unique medical properties of interest to cancer researchers. However this majestic serpent is now under threat of extinction as its habitat disappears. Along with lion tamarins, cougars and woolly spider monkeys, bushmaster snakes are one of many endangered species unique to Brazil's Atlantic Rainforest. Not to be confused with the mighty Amazon, the Atlantic rainforest once covered the entire coastal region from the north-east to the Argentine border in the south. But now only 6% of it remains, a few tiny islands of green, most in the state of Bahia - and even these are under threat. There are now plans by ENRC, a British-Kazakh mining company, to build a railway right through one of the few remaining areas of virgin Atlantic rainforest. ENRC's aim is to transport iron ore from a mine in the interior to the port of Iheus, despite the region being named by Unesco as a priority region for conservation. It would of course bring jobs. But for Souza, who has been battling for years to preserve this unique ecosystem, it's a slap in the face. For him the railway would be an ecological disaster for the rainforest and his beloved bushmasters.